The Doctor wandered through the corridors of his own TARDIS wondering where his young companion was. He had checked all the obvious places, and worriedly checked some of the less obvious and more dangerous ones, like the Cloister Room and the engine room. There was no reason to think she had been in either. He finally found her in the drawing room. The TARDIS seemed to have decided to keep that in potentia room as a permanent fixture. It had decided that a room full of squashy armchairs and occasional tables and a fake window looking out on a garden he had never been into in his life was essential. It was a nice room, but he wasn’t sure WHY he needed it. Susan was sitting in one of the big chairs, with her legs curled up under her. She had a mug of coffee and a box of chocolates and she was looking through the big photograph album that sat on the dresser. The Doctor stepped quietly beside her and took one of the chocolates. It was melting in his mouth as she looked up at him. The Doctor sat on the arm of the chair and turned some of the pages. The TARDIS was far more nostalgic than he was. He didn’t bother to look back over his life very often. Not that he had many things he TRULY regretted, but it still seemed easier to look to the future than dwell on the past. “So the women… your girlfriends?” she asked. He laughed softly. She looked up at him. “No,” he said. “I never really could have called any of them that. Sarah Jane… I was very fond of her, and perhaps if I was any other man in the universe she might have been. But no… she was just a very special friend. They all were. Except….” He turned to one of the very earliest pages. Susan looked up at him. He was still smiling with his mouth, but his eyes looked strangely sad as if this was a very bitter-sweet memory. “Who is she?” she asked looking at the girl in the photograph, short dark hair and brown eyes, pretty and petite, standing outside the TARDIS. “My granddaughter, Susan,” he said quietly. “Oh!” Susan looked at the picture and then back at The Doctor. She remembered what he had said to her when he asked her to join him in his travels. An old man? Susan looked at him. He was far from that in appearance, but she DID understand that in REALITY he WAS far older than she could begin to imagine, and once, when that other Susan had travelled in the TARDIS he had actually LOOKED it. “Learn and grow, and when you’re ready to leave me, be enriched by the experience,” he said. Susan would have liked to have asked him some more questions. It was nice there for a few minutes, with him sitting next to her talking about his past. She wanted to know more. The photo album had been a nice glimpse into his life. And she was quite glad to be a substitute for the granddaughter he so obviously loved once and still loved in his way. “Isn’t the landing a bit bumpy?” she asked when she reached the console room and had to grab hold of the railing as they lurched around. Even Ric was being buffeted about on his hover pads. “Yes, it is,” he admitted. “I don’t know why. It should have been a straightforward landing on Earth in the late 1980s. But we’re banging around like mad. Just hold tight. Ric….” He reached the mechanical creature and adjusted some controls inside his side panel. At once there was a metallic clang as Ric’s body became firmly fixed to the floor. “Wish we could do the same,” Susan pointed out. And he DID grin. Which made Susan laugh. There was something about his smile that was totally infectious. Even though she was a little scared she was laughing with him. “There, that wasn’t so bad,” The Doctor said as the sound of materialisation died away. He stepped away from the console and was jolted onto the floor as the TARDIS began to move again. Now Susan was a bit scared. “What is it? Why are we still moving?” she asked. “We’ve materialised on a moving vehicle or vessel,” The Doctor answered. “Happens sometimes. I’ve had some FUN with the TARDIS landing on boats, I can tell you.” He reached to turn on the viewscreen. “If we’re on a ship, what the HECK is THAT?” Susan asked as they both looked at a huge pink face. It was a humanoid face, but one with strangely immobile features. The eyes looked painted onto the face, and they stared with blank astonishment. “What happens from time to time?” Susan asked. “The dimension circuit is mixed up. We’ve materialised right where I wanted us to materialise, right date, right planet, everything, but we’re the wrong size.” He went to the door and opened it. Susan followed him. The pink face belonged to a Barbie doll which was leaning up against the TARDIS. A large stuffed tiger lay across both and they were wedged against a wall made of some kind of woven wooden laths. “You mean we’re… we’re the size of a Barbie doll?” Susan was astonished. “Why not?” Susan couldn’t think of a single reason why not. She took The Doctor’s hand and went to the door. They looked up at the wicker sides of the toy basket. They were the equivalent of a twelve foot wall. The TARDIS was almost upright at the bottom of the box, wedged between Barbie’s boyfriend, Ken, and a very pink Barbie kitchenette. The floor was littered with glittery beads and fake jewels from a Barbie make your own jewellery kit. And he promptly slipped on a glitter bead and landed on his back. “Master needs assistance,” Ric said with genuine concern in his electronically synthesised voice. “Just a hand up,” he said, reaching out to Susan. “No,” The Doctor decided as he stepped more carefully to the side of the basket. He touched the wall carefully then turned to Ric. Ric’s laser light turned on and they stepped back as he cut a five inch Doctor and Susan action figure sized hole in the wicker basket. The Doctor examined the cut edges carefully. “Dalek.” He finished her sentence for her, but volunteered no further information about what Daleks were. “I think he means there are people here,” Susan whispered. “One person,” The Doctor confirmed. “And one huge but otherwise friendly looking dog.” He looked up at the bed in the corner of the room. The dog looked back at him curiously. It was a sort of long haired terrier with every colour possible in a dog and a pair of appealing brown eyes. Its nose was between two hairy paws as it peered down at them. “Bootle?” The Doctor looked at the dog then back at Susan. 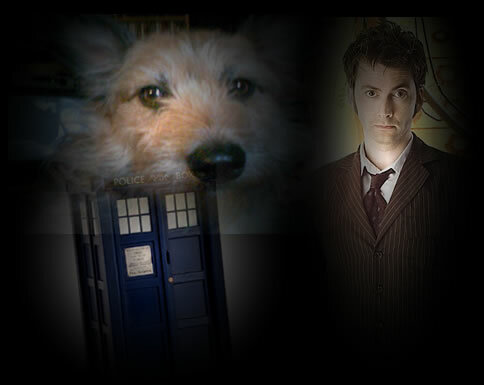 “Yeah,” The Doctor smiled as he looked up at the dog again. “Good girl, Bootle. You go back to sleep. We’re just…” He groaned and looked around. There weren’t many places they could run to. There was only one possible place the dog couldn’t get them in. He just wondered if they could avoid dying of embarrassment instead of dog bite. They ran for it just as Bootle sprang from the bed, yapping excitedly. Susan clung to his hand as they pushed open the plastic door and crushed into the Dream House’s reception room. “It’s not the TARDIS, is it,” Susan laughed as Ric slid in behind them and The Doctor closed the door. “So… who is that in the bed then?” The Doctor peered through the hinge side of the door and saw a rather puzzled Bootle snuffling about. Beyond her hairy bulk he could still see the bed where the sickly pale face of a dark haired girl aged about ten years looked over the edge and called to the dog in a quiet voice. Bootle took no notice. She took a deep breath and called out. The Doctor noticed that the effort of raising her voice was painful to her. “Silly dog,” mum said, turning and pulling the animal away. The Doctor noted that she was wearing maternity clothes - about six months pregnant by Earth standards he guessed. “Come on, you daft animal, out of here.” She pushed the dog out of the room and came back to the bedside. “Are you all right, my pet?” She settled the girl back in her bed and kissed her cheek. The girl said something quietly and then turned over in the bed, facing the wall. Her mum sighed and stood up stiffly and went out of the room again. They heard the dog yapping still as she took it downstairs. They waited a few minutes for Heather to sound as if she was asleep again before they quietly moved out of their hiding place again. The Doctor stopped by the side of the divan bed. He took hold of Susan’s hand and squeezed it gently. “THAT’S WHY!” The Doctor shouted as he looked up and saw something dark and strange drifting across the room. It was like thick, black smoke, but it had a shape, a nearly Human shape, like a shadow if a shadow had depth to it as well as width. Susan watched it and knew it had to be BAD. It had no face. It made no sound. But it still FELT evil to her. The Doctor wasn’t looking at it. He was climbing up the sheets onto the bed. Susan grabbed a piece of sheet and started to haul herself up after him. It wasn’t easy. She had never been all that good at climbing ropes in PE class and the sheet was smooth and difficult to get a grip. The Doctor was a natural. He climbed as easily as he walked, watching the sinister shadow draw nearer and nearer. But she was dangling like an idiot, unable to go up or down. “Mistress!” She could hear Ric on his hover pads whirring below her. “Mistress, stand on me.” She looked down and saw his metal back just under her shoes. She let him take her weight as he began to rise up vertically. But semantics were unimportant right now. She turned and saw The Doctor standing on the bed, warding off the shadow with his sonic screwdriver. She saw her sister staring at him as he did so. They both stared as the screwdriver drew off energy from the shadow. He was duelling with it. The screwdriver was giving out an energy itself that forced the shadow back, but it rallied and came back with something like lightning that hit the tiny sonic screwdriver before earthing itself in The Doctor. Susan and Heather both saw his pained expression as he absorbed the energy. The little girl was doing a remarkable job of not asking WHY a five inch man was fighting a battle with a shadow entity on her bed. “Stay back,” he warned. “Don’t touch me, either of you.” Heather drew back her hand from him. Susan stepped back, putting her hand on Ric to restrain him, too. He was weakened by the attack but he kept fighting. Again he attacked the shadow with the sonic screwdriver. Again it hit back, sending him reeling back, tripping over the sheets. On his back, he aimed again, and this time the shadow shriveled and disappeared. “Doctor!” Susan could bear it no longer. She ran to his side but he put his hand out to warn her from touching him. “What’s a TARDIS?” Heather asked, following the conversation between the two of them. “Hide,” Heather told her. “I can hear mum coming back upstairs.” She pulled her pillows up so that they formed a space behind them, a sort of pillow cave. Susan and Ric ran for it while Heather lifted The Doctor gently in her hands and placed him there just before her mum came into the room. Bootle took advantage to bound into the room again and started to fuss around the bed, taking far too much interest in the pillows. “Can I have the blue box thing out of the toy basket,” she asked. Her mum turned and picked up the TARDIS and gave it to her. “Come on Bootle. We’ll see you later.” Her mum and Bootle left the room. She listened for them going downstairs before moving again. “I have to go into the box,” he answered her in a weak voice. Susan ran to open it and Heather laid him down inside the door. She peered inside, surprised by the bright, big interior of the TARDIS and watched as The Doctor used the railing and other handholds to help himself walk to the console. Susan stood at the door with Ric at her side and watched as he laid his hands on the console. The green lights of the console glowed a little brighter as it drew out the stored energy from The Doctor’s body. After a few minutes he stepped back from the console and turned around. He smiled widely. “I wish we could make you better as easily,” he said as he came to the door and touched Heather’s fingers gently. “Yes,” she said. Getting out of bed was not easy for her. She was weak and even walking a few feet to the middle of her room was difficult. Susan thought about that for a moment. Heather managed to scramble back into bed. The Doctor went to her side and put his hand on her cheek. He felt how flushed she was from the effort. He took hold of Susan’s hand and called Ric to his side. Ric hovered by the bed and The Doctor and Susan stood on his back carefully as he descended to the floor. Heather lay there and watched as the two tiny people and their strange robotic companion ran to the police box and went inside. There was a humming noise from it, then a sort of wind, and she watched in amazement as it began to get bigger. Then, to her even greater surprise she could see two rooms around her. Her own bedroom, and the inside of a strange room that looked like a cave with computers in it. That room became more solid and her bedroom more insubstantial until she was lying in her bed inside the strange room. It was inside the police box, she realised. She had seen it before, but tiny. Now she was in the room. “You’re big now,” she said with a laugh that took so much effort it made her swoon dizzily. The Doctor held her hand gently until the uncomfortable moment passed. “What IS the Shadow?” Susan asked as she sat on the edge of the bed next to her sister. “You don’t need me to help?” Susan asked, looking disappointed. The Doctor smiled as he left them to it. He used the sonic screwdriver like a divining rod, seeking out the other Shadow and the crack in the universe he had to seal to prevent any others slipping through. Earth was a leaky sieve for that kind of thing. Quite apart from the major rifts such as the one in Cardiff that had caused him so much trouble, there were always these hairline cracks forming. He wondered if there was something about Earth that made it more susceptible than any other planet he knew. Maybe, he thought, he should make some kind of detailed scientific study. He might find something that would stop these things happening. He couldn’t keep on invading private homes to stop the Shadows of the Howling Halls from murdering the inhabitants. At the very least, he could at pass on anything he found to that lot at Torchwood. SOME of them had a bit of initiative. They might be able to use the information. As he came into the kitchen the sonic screwdriver buzzed ominously, telling him that the Shadow was there. He looked around cautiously. Then he heard a very faint sound - a sort of metallic clink. He span on his heels as the door flew off the microwave oven with enough force to decapitate him if he hadn’t ducked. It hit the opposite wall, destroying a rather pretty clock in the shape of a half-peeled orange and the bits of clock and door slid to the floor. The Doctor didn’t notice those details though. He had his eye firmly on the shadow as it unfurled itself from the doorless microwave and resolved into an inky-black man-shape. There was a susurration that might have been a voice. It asked what sort of being he was who challenged the Shadow. The susurration formed the words ‘Time Lord’ and he noticed it back off just slightly. The creatures of the void had obviously heard of him. He half-smiled at that as he held his sonic screwdriver in the way that duellists of old held a sword and waited for it to rally and come back at him. It did. As he raised his sonic screwdriver it raised a hand and the energy beams clashed in the air between them, totalling Mrs Rawlings’ pretty blue and white glass lampshade. The Doctor felt the force of it in his arm the way he felt a really good swordsman’s blow against him in a traditional duel. The Shadow was STRONG. The other one had been, too. He had got in a couple of lucky shots and drained its energy mostly because he had been too small for it to target easily at first. But he couldn’t have fought another fight that way. His every cell was screaming in agony from the energy he had absorbed. If he took a full force blow like that again it would saturate his body and his only defence then would be to regenerate, just as he’d been forced to do on the Gamestation after he had absorbed the vortex. This was a different sort of energy, not quite so potent, but it WAS dangerous still. It would kill a Human stone dead like they had been electrified. That was why he had to protect them. “Die, Time Lord!” Again the susurration as the Shadow tried to goad him, but The Doctor had learnt the rules of duelling from the best. He kept calm. He watched his opponent and he raised the sonic screwdriver once more and aimed it at the Shadow. He caught it where, on a Human, the heart was and it screamed as the screwdriver started to draw its energy. It raised its hand and sent another bolt of energy towards him. The Doctor’s body jolted as he absorbed it, but it was weaker. His body was coping with it and he fought the pain and steadied his hand as he continued to draw out the Shadow’s energy. The sonic screwdriver felt hot in his hands as it became a sort of battery, storing what it drew out. Rather the screwdriver than himself, he thought. “You’re dying,” he said as another bolt of energy hit him, but this one hardly stronger than the current in an electric fence. The next was more like the annoying feeling of a joke hand-buzzer. The Shadow was finished. He could see through it now. It was becoming more and more unsubstantial. The Doctor held the sonic screwdriver in both hands and watched as the entity’s remaining molecules seemed to implode. “Yes!” he cried. 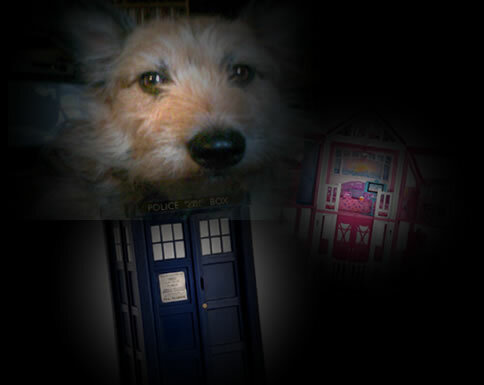 He looked around the kitchen and then he turned and ran back to the bedroom, back to the TARDIS. Susan was sitting on the bed with Heather. An empty ice cream bowl was discarded between them. Ric was beside the bed doing a remarkable impression of Bootle in guard dog mode. The Doctor smiled at the girls as they looked his way. The two girls watched as he pressed buttons apparently randomly on different sections of the six sided console, leaping around it madly and grinning triumphantly as he stood back from it. The Doctor looked at Susan then back at Heather. The Doctor looked at Heather again. He WASN’T allowed to make people live when they were supposed to die. But was there any rule about how long they could live before they died? Would letting Heather survive long enough to see her sister born, see her take her first steps, learn to talk, cause that much of a ripple in time? He sat her on the battered and patched chair near the drive control while he programmed the auto pilot to take them on a gentle orbit around Earth and bring them back to where they were no more than five minutes later. Then he came and lifted her again, sitting her on his knee. Susan came and sat beside him and he put his arm around her shoulders, holding them both as they watched the viewscreen. Heather was so entranced by a view of Earth only professional astronauts of her time ever saw, that she hardly noticed the way The Doctor’s hand glowed slightly as he touched the side of her face. Susan noticed it and wanted to ask what he was doing, but she hardly dared to. He had already told her he couldn’t do the one thing she WANTED him to do. Mrs Rawlings came up the stairs to her daughter’s room. Bootle yapped noisily at her feet but she hadn’t the heart to tell her to be quiet. She put her hand on the door knob hesitantly. She always did. The doctors had never been able to give any precise time frame for Heather’s illness. She always dreaded opening the door and finding her lying there still and unmoving. She knew it would happen ONE day. Heather was sitting up in bed playing with her dolls. She looked happy and somehow energised. She laughed as Bootle jumped up on the bed and tried to lick her face off. Her mum talked some more with her before going downstairs to start tea. Bootle curled up on the bed. Heather looked around the bedroom and smiled as she heard a very peculiar noise and felt the rush of air. Then The Doctor and Susan stepped out of the TARDIS. They stepped back into the TARDIS and The Doctor smiled at Susan as they dematerialised. The TARDIS materialised in the back garden of a suburban semi close enough to the sea front at Southport to have a faint tang of salt in the air. As The Doctor and Susan stepped out a dark haired woman aged about thirty ran out of the kitchen door and tried to hug both of them at once. “And it didn’t cause any wobbles in the continuum?” Susan asked as she helped her sister make tea and sandwiches and tried not to trip over a yappy dog called Crosby that looked like a duplicate of Bootle and was having an interesting time trying to work out if Ric was the same species as she was. The Doctor smiled happily as he sat back and watched the two sisters chatting together. Some of what they had to say was ordinary domestic gossip such as Earth women always talked. Some of it was about Susan’s adventures so far in the TARDIS with The Doctor. The best of both worlds. He promised himself he would KEEP that promise and sipped coffee from a mug with pictures of fruit all over it, enjoying a rare moment of domesticity before they went off into the dark unknown once more.